Biofilms are colonies of microbes. They chiefly contain bacteria, but biofilms can also include protozoa and fungi. Biofilms form anywhere there is moisture and a surface. In other words, everywhere—including many surfaces inside the human body. The ring inside your toilet bowl and plaque on your teeth are examples of biofilm. Certain types of bacteria initiate biofilms that can attach to a moist surface with specialized adhesion structures called pili. Once adhered to the surface, bacteria stick together and start producing a matrix of slime called extracellular polymeric substance (EPS). Once the matrix establishes, other kinds of microbes can join. To get a sense of how a biofilm operates, imagine a crowded dance floor with bodies squeezed together forming a uniform mass, swaying to the rhythm of the music. A polysaccharide shell on the surface of the biofilms protects the organisms inside from starvation, drying out, the immune system, and antibiotics. The surface can include minerals, such as calcium, and blood products, including fibrin. Safe inside the biofilm, microbes are free to mingle and exchange information. Communication between bacteria, called quorum sensing, is accomplished by signaling molecules. Once a community is formed, particular groups of microbes take on specialized roles of performing metabolic functions for the entire unit. Water channels develop within the biofilm for moving nutrients and signaling molecules. The biofilm grows by cell division and recruitment of new individuals. In essence, the biofilm becomes an organism unto itself. Biofilms are as ancient as any lifeform. They were likely the bridge between single cell organisms and higher multi-cell organisms. Biofilms cause illness by damaging the surfaces to which they attach to. If a biofilm becomes massive enough, it can cause obstruction. Once a biofilm reaches a certain size, it disperses, allowing inhabitants to spread and colonize other surfaces. Spreading biofilms can accelerate damage. Bacteria in the body are constantly trying to form new biofilms, and the immune system is constantly breaking them down. Above: The five stages of biofilm development are (1) initial attachment, (2) irreversible attachment, (3) maturation I, (4) maturation II, and (5) dispersion. Bacterial vaginosis can be associated with biofilm in the vaginal wall. Biofilm on the bladder wall is a factor in chronic urinary tract infections. Middle ear infections are associated with biofilm. Heart valve infections are biofilms. Chronic vertigo caused by calcium deposits in the inner ear may be a form of biofilm. 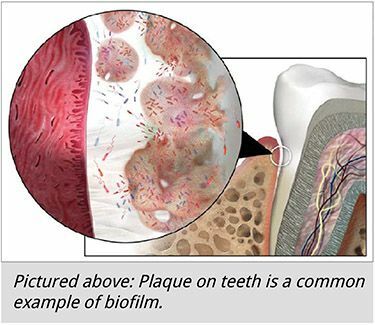 Dental plaque and gingivitis are classic examples of biofilm. Biofilm in sinuses and bronchial tubes are associated with chronic sinusitis and chronic bronchitis. Arterial plaques causing heart attacks and stroke have many characteristics of biofilm and are often found to harbor bacteria. Hospital infections involving indwelling devices such as catheters are associated with biofilms. Biofilms readily occur in the intestinal tract. In fact, the formation of biofilms in the colon and appendix are quite normal and are supported by the immune system. It may be a mechanism for reinoculating the gut with favorable bacteria. 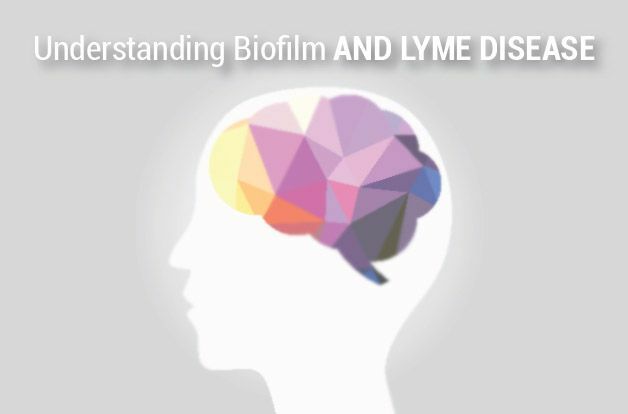 There has been a lot of talk on Lyme forums about Lyme disease being a biofilm disease. 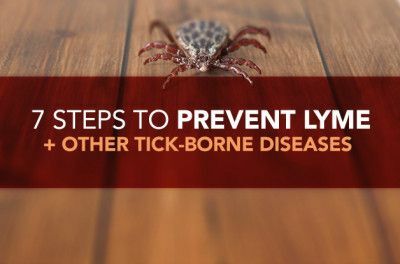 This idea stems from a study done in a lab showing Borrelia, the bacteria associated with Lyme disease, forming a biofilm. Borrelia can form a biofilm inside a test tube. Forming and participating in biofilm is a natural trait for most bacteria. In fact, if you can’t form a biofilm, you’re not much of a bacteria. The symptoms associated with Lyme disease, however, are not typical of biofilm diseases. Bacteria manipulating the immune system to generate inflammation is what causes Lyme disease symptoms. Inflammation breaks down tissues and allows the bacteria to access vital nutrients. When it comes to biofilms in the body, it wouldn’t be surprising to find that Borrelia can join the party, but once inside the biofilm, it would lose its ability to manipulate the immune system and therefore lose its capacity to cause symptoms. That said, biofilms are not how Borrelia causes illness. Chronic Immune Dysfunction caused by Borrelia, however, could allow biofilms in the body to flourish. 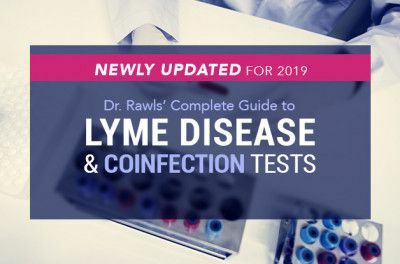 This may be a factor with an intestinal disease that usually accompanies Lyme disease and skin diseases sometimes associated with Lyme disease (but it is probably a slight factor compared to other things). Calcium deposits in the inner ear causing dizziness may also be related to biofilm. As to whether biofilms prevent antibiotics from eliminating Borrelia, other factors play a greater role in determining antibiotic resistance. Borrelia grows very slowly, exists in small concentrations in the body, can bore deeply into cartilage and brain tissue, and can live inside cells—all factors that enhance resistance to antibiotic therapy. Though Lyme disease is not a biofilm disease, it is a good idea to support the body’s ability to deal with biofilms during any illness. A healthy immune system is the best way to slow formation of biofilm in the body. The immune system is always breaking down new biofilms that start to form—it’s part of the everyday struggle of life. 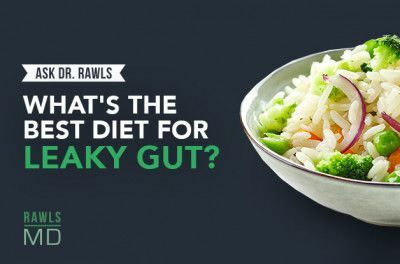 Digestive enzymes help with digestion, but also help break down biofilm in the gut. Systemically absorbed enzymes may also dissolve other biofilms in the body. N-acetyl cysteine (NAC) is known to break up mucous and may also play a role in dissolving biofilm. EDTA, a chelating agent, removes minerals from the biofilm surface and can help break up a biofilm (but can also remove essential minerals from the body at large). Oxygen and nitric oxide penetrating into the biofilm can help degrade the biofilm. Blasting biofilms with strong chemicals and potent antibiotics don’t work because it suppresses immune function. Supporting healthy immune function and etching away until the biofilms are gone is the best approach.